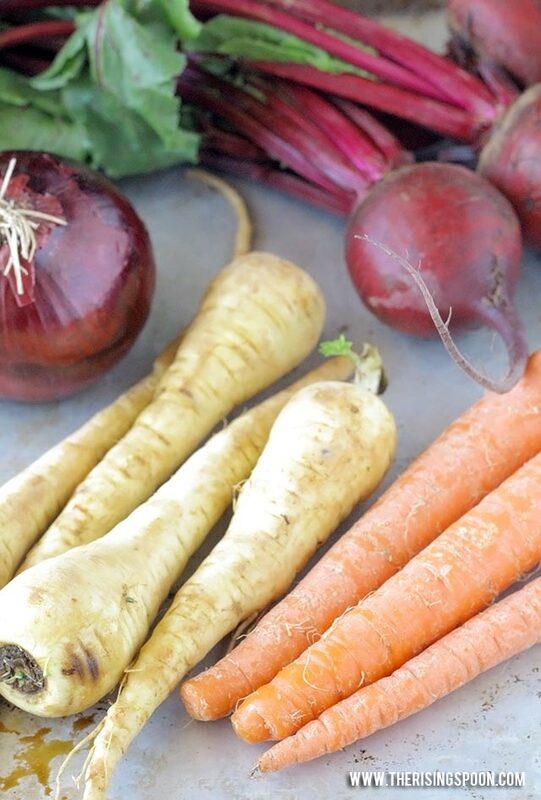 How often have you thought, "Boy, I'm craving some root vegetables"? Yeah, probably never. Well, I aim to change that! Let me introduce my favorite way to fix root vegetables: roasting them in the oven with balsamic vinegar! 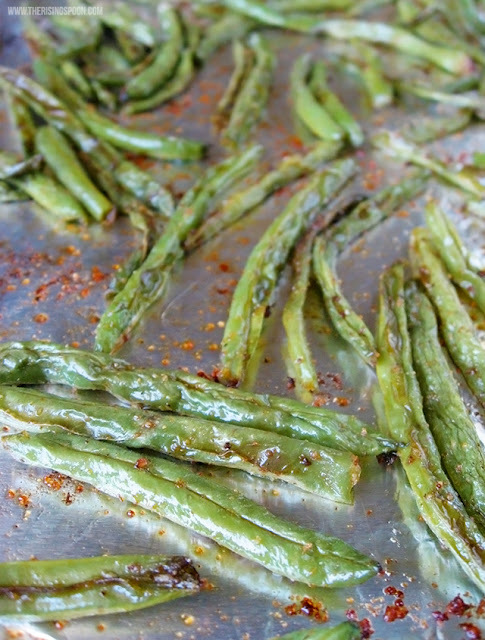 Just like my balsamic oven-roasted green beans (the most popular recipe on the blog), these root vegetables start to caramelize in the oven along with the vinegar, which concentrates their flavors and brings out a subtle sweetness. 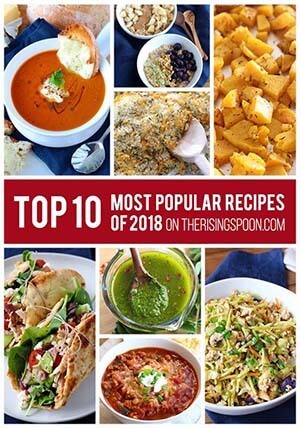 I came up with this recipe about 9 months ago when my dad was going grain-free and needed more tasty vegetable options. He loves balsamic vinegar, and I knew he would benefit immensely from eating root vegetables since they are full of fiber and nutrients. So, I fixed this when I was home in Kansas for a visit. And, they were a huge hit! I was ecstatic to see my dad getting excited about vegetables again. He watched me fix it the first time so he could learn the easy techinque (really, just peeling, chopping, seasoning & popping in the oven), then did it on his own a few days later. 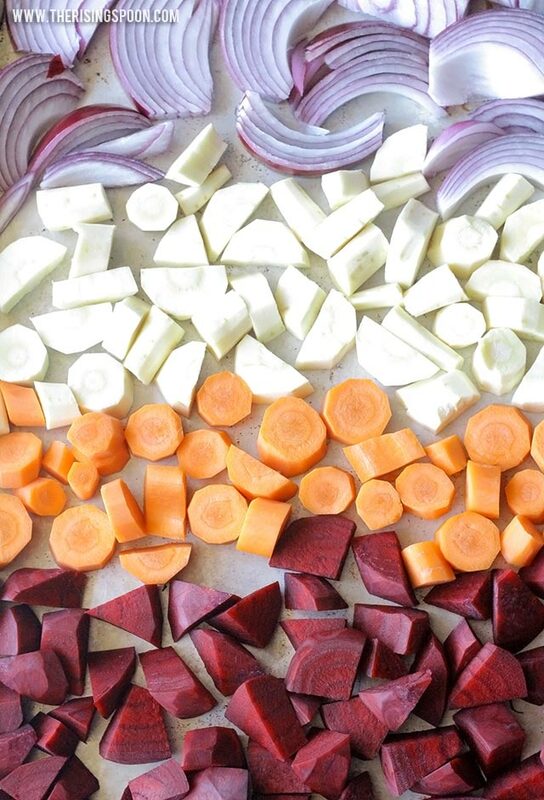 There are quite a few root vegetables to choose from when making a side dish like this, but I could only fit so many on one baking sheet, so I went with my favorites: beets, parsnips, carrots, and onions. Beets are so healthy (not to mention beautiful - look at that color), but lots of folks get turned off by their earthy taste. If that's the case, look for golden beets, which have a sweeter flavor. They're a really good option for picky eaters. If you don't have access to parsnips (or they're out of season), you can easily double up on the carrots; however, when you get a chance, I highly recommend them. I only recently tried parsnips for the first time and immediately fell in love. They're like a spicier carrot. Not in the "hot and spicy" sort of way, but more like the spice from ginger. 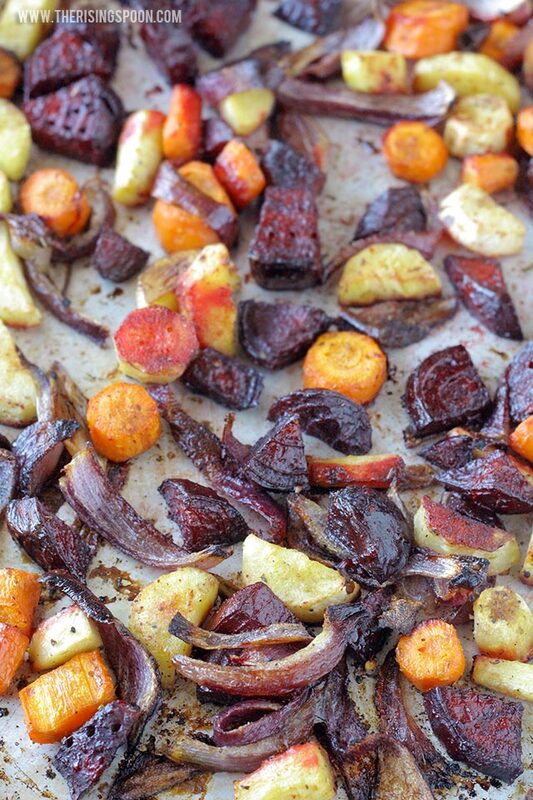 I love these balsamic roasted root vegetables so much that I eat them cold, straight from the fridge, as a snack. No joke! They're also excellent on salads or served as a side for breakfast and lunch (not just dinner) - so it's a great excuse to roast up a big batch to use all week long when you're meal planning. 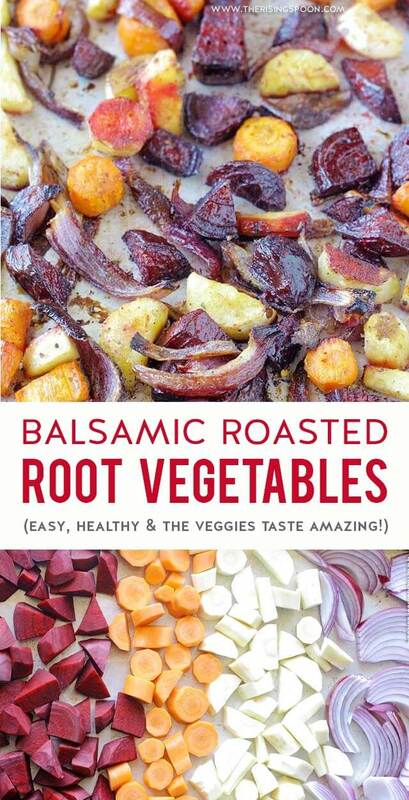 An easy roasted root vegetable recipe with beets, parsnips, carrots & onions tossed in cooking oil, seasonings, and balsamic vinegar then cooked until tender and slightly caramelized. 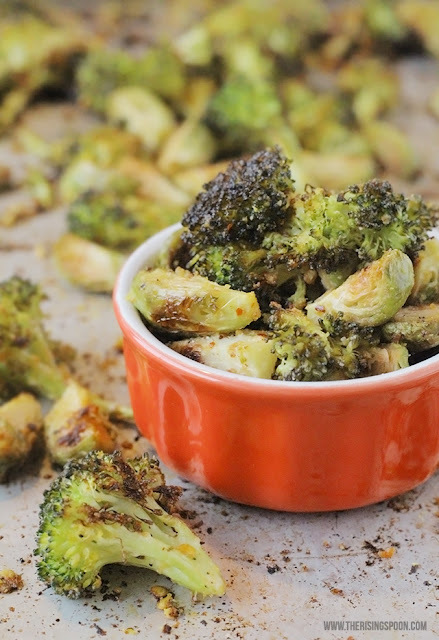 This method makes the vegetables taste amazing with hardly any work! Pre-heat the oven to 400 degrees. Peel and chop the beets, parsnips, carrots, and onions into medium chunks. (I like to prep the beets first since they turn my cutting board & knife red, so I can give those utensils a rinse, then quickly move on to the other veggies.) 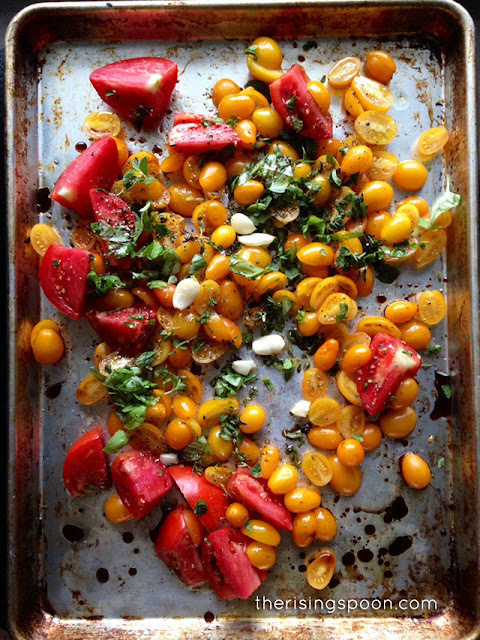 Lay the veggies out on a large rimmed baking sheet and drizzle with cooking oil. Mix everything around with your hands so the oil coats all the vegetables then season with granulated garlic, Italian seasoning, sea salt, black pepper, and crushed red pepper. Toss everything again to make sure the seasonings are well distributed, then add more if necessary. 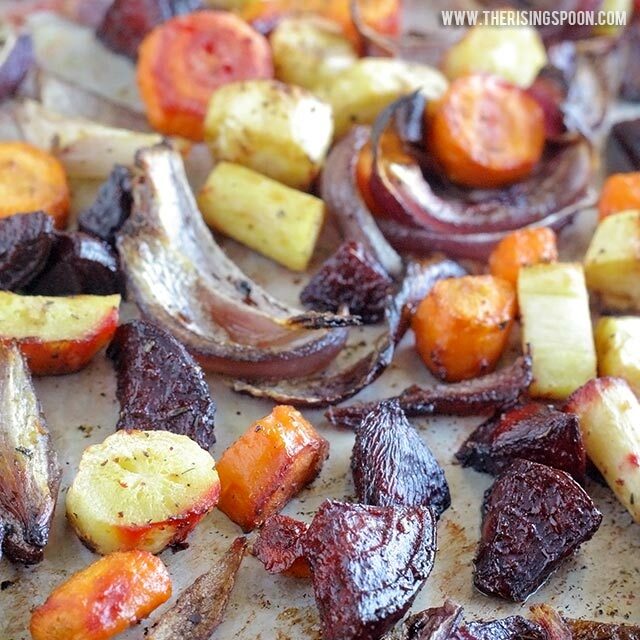 Drizzle or shake the balsamic vinegar on top of the root vegetables, then pop in the over. Bake for 45-55 minutes, or until all the vegetables are fork tender (the beets usually take the longest to cook), stirring once half-way through. If you want to decrease the cooking time, chop the veggies into smaller pieces and bump the heat up to 425 degrees. Check them after 20 minutes or so and then pull them out when the beets are fork-tender.